Got a herniated disc again? Are you getting frustrating with your herniated disc? Want to know why your disc keeps going out? In this issue of bodiempowerment I’m going to help you understand why your disc keeps herniating. Your disc is found between each vertebrae and helps give your spine flexibility. Injuries to your body like your hand it will hurt. Your disc on the other hand is not like the rest of your body. You can injure your disc and it won’t hurt. You wouldn’t even know anything is wrong. That’s great, isn’t it? The answer is Yes it’s great to feel no pain but No it’s not great when you don’t know if something is damaging your lower back disc. When you slouch for example you are putting pressure on your disc forcing the inner jelly like part of the disc called the nucleus backwards and damaging the annulus. Only you can’t feel the damage. When a teenager slouches for hours, weeks, and years in a row and you will start to develop a tear going backwards. Even with the tear or fissure in the slouching teenager, he/she still has no pain. Fast forward 10, 20 or 30 years years and the story changes. 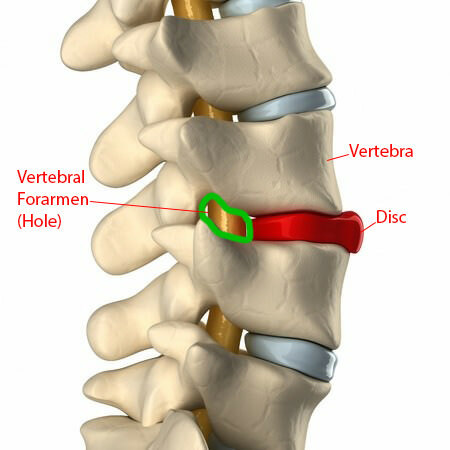 After years of forward bending and slouching the disc now has tears or fissures that reach the outer 1/3 of the disc. Once the fissure reaches that outer 1/3 of the disc your middle aged adult will finally get pain. The secret is your disc doesn’t have any nerves on the inside. In fact there aren’t any nerves on the inner ⅔ of the disc. This means that when you damage the outer ⅓ of the disc that’s the first time that you will feel pain from the disc. Why? That’s our design. It’s not a bad design. If there were nerves all the way through to the middle of the disc. Some of you would have had pain from your disc at a much earlier age. Some of you would of had pain as a teenager. Shockingly, the process of degeneration of the disc starts around 8 years of age. That’s when the blood vessel that gives your disc starts to decay, making the disc vulnerable to degeneration. That doesn’t mean kids at age of 8 have degeneration of their discs. It means the process of degeneration starts at that age. By 20 years of age all the blood vessels have disappeared making the disc dependent on the vertebrae above and below for all of it’s nutrition. Your nutrients for your disc have to travel a long way through the disc into the centre where there are live cells. Live cells need nutrition and blood is what gives it nutrition. Without blood vessels the disc doesn’t get nutrition efficiently so the disc starts to degenerate. 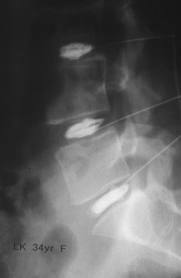 Degeneration of the disc eventually leads to disc herniations. Degeneration of the disc causes tears in the disc leading to disc herniations. If your disc is over 40 years of age you should expect that it has some tears in it. When the disc fissures are large enough to allow the nucleus to push into the annulus causing the disc to bulge then you are at the stage of a disc herniation. Research has found that 30% of 30 years olds with no pain have disc herniations. While 60% of 60 years with no pain have disc herniations. So what causes your pain? Fissures in your disc. A large enough fissure puts more pressure from the nucleus onto the outer 1/3 of the annulus with the nerve ending. The nerve senses the pressure of the annulus causing pain. Fissures so large that they break through the last layer of annulus and create a hole depressurizes the disc like popping a balloon. When depressurized disc herniation is no longer contained and oozes out like jelly from a doughnut. With a depressurized disc exercises aren’t as likely to help the situation as much. 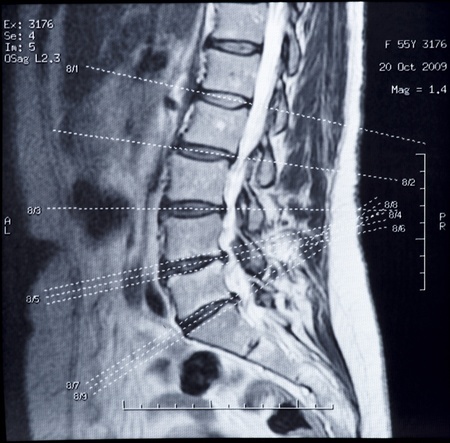 Often waiting 6 months through the pain reduces the pressures on the disc if you didn’t want to do surgery. However there are no guarantees that you will get better after 6 months. Your posture and movements of your spine also change the movements of the disc. Bending at the waist will increase the pressure on front of the disc and cause the nucleus to move backwards. Your forward bending or other postures will put pressure on the outer part of the annulus and cause you pain. What is the best way to diagnose your disc herniation. Discography seems to be the gold standard according to some authorities but it is controversial. First your doctor has to inject the disc with contrast dye which creates a hole in the disc. There is no way to inject the contrast dye without creating a hole. However to some it remains the gold standard. Mechanical assessment in the hands of a skilled clinician has been found to be superior to MRI to predict which disc is painful and if the annulus is intact or not. Sadly though patients are often diagnosed by MRI, many times at the insistence of the patient, without the clinician having done a thorough and competent mechanical examination. The examination is often cursory many times lacking a thorough neurological examination. It’ really up to you as a patient to make sure that you get a thorough history and examination. If you didn’t and simply got an MRI after a cursory exam than chances are it’s diagnosis by MRI which is very common in India judging by the comments on this website but happens quite often in Western countries. Your disc herniation can be called a bulging disc, slipped disc, disc protrusion, disc extrusion and disc sequestration . A disc herniation is the non-specific and can mean any of the above. Disc Bulge: The annulus part of the disc is enlarged or swollen like a cupcake that has grown bigger than the holder. The disc is usually enlarged over a broad area. Sometimes you can have a focal disc bulge which is like when you squeeze a small section of a balloon and you can see that the balloon rubber is thin. As the name suggest one small spot is enlarged. Disc Protrusion: The annulus usually involves a fissure large enough to cause the outer annulus to bulge out but is still contained within the annulus. Disc Extrusion: The nucleus has squeezed outside of the last layer of the annulus. Conservative treatment is difficult and can be helpful depending on the case. After 6 months people often gets better since the body recognizes the oozing material something that shouldn’t be there and breaks it down. Most of the time though there is still some pain. Strangely though with a disc protrusion or disc bulge the same break down doesn’t seem to happen. The nucleus has to spill out. In other words for the long-term sometimes it is better to have a more serious disc extrusion although it will hurt a lot over the short term. 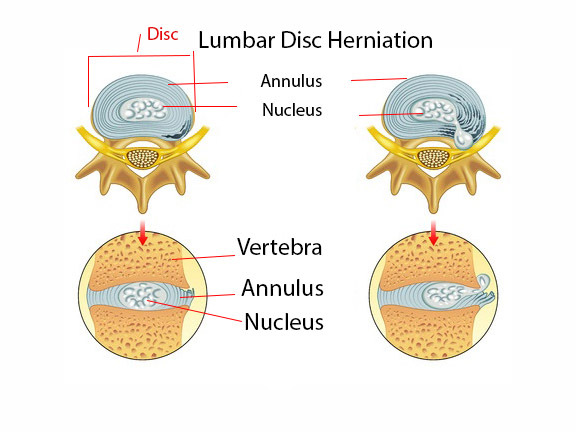 Disc Sequestration: The nucleus has squeezed outside of the annulus and a piece of it has separated from the original disc and often found in the spinal canal. Again after 6 months people often people get better. People with disc sequestrations often get surgery. Leave your thoughts to My Herniated Disc Again! Why Does My Disc Keep Going Out?